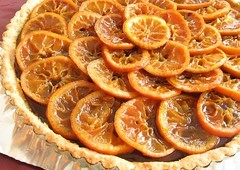 Roasted Clementine and Chocolate Tart With Macadamia Nut Crust - Do You Know The Muffin Man? Notes: The crust was a bit too crumbly. I used satsuma tangerines instead of clementines; I prefer to use organic ones when I know the peel will be eaten. The slices were a little on the thick side because I didn't want them to disintegrate, but they weren't quite soft enough. The bitter and tart flavours of the oranges contrast well with the ganache filling.